THURSDAY - APRIL 18TH @ 10 A.M. Details available for constructing a containment facility including pipe boots, concrete attachments, penetrations, and vent details. Both PDF and DWG available. We are a non-profit organization providing education, research, and support for the flexible and fabricated geomembrane industry. Fresh water is a precious resource with demands rising daily and supply greatly fluctuating. Only two (2) percent of all water on Earth is fresh water with the other 98% being salt water. This 2% of fresh water is comprised of: 87% ice, 12% groundwater, and 1% rivers and lakes. Thus, only 13% of the available freshwater is readily accessible. Therefore, it is imperative that we capture and hold these limited water resources for agriculture, domestic use, and industry and also protect valuable groundwater from surface or subsurface contamination. The FGI’s Pond Leakage Calculator is a Microsoft EXCEL spreadsheet based on Darcy's Law of Seepage and provides a comparison between leakage rates from a canal, pond, or reservoir constructed with compacted fine-grained soils and a geomembrane liner system. The Leakage Calculator allows the user to input the size of the containment basin (including length, width, depth, side slope angle and freeboard), the anticipated level of hydraulic conductivity of the compacted soil or geomembrane liner, and the relative cost of water in dollars per acre-foot of water. The Calculator then calculates the volume of the basin in gallons, a comparison of leakage rates between the compacted soil and geomembrane liner systems in gallons, and the cost of the leakage based on the cost of water per acre-foot to replace it. This Calculator is designed to help consultants, engineers, architects, and end users decide how to line their canals, ponds, reservoirs, and basins to capture and/or protect valuable fresh water. The Calculator does not consider variances in construction quality and operational techniques on the long-term effectiveness of the chosen liner system. The FGI has additional research and publications to help with other aspects of successful water containment applications. Four (4) popular types of geomembranes are available for pond liner systems. 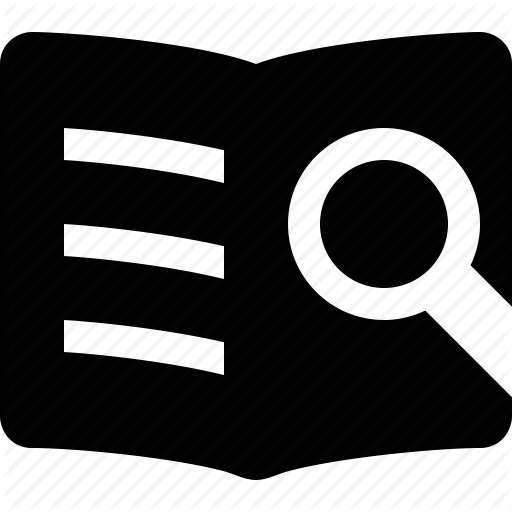 These four (4) geomembranes in ALPHABETICAL order are: (1) EPDM, (2) reinforced polyethylene (RPE), (3) Polypropylene (PP), and (4) Polyvinyl Chloride (PVC). EPDM (Ethylene Propylene Diene Monomer) geomembranes are unreinforced and have been used for the construction of ponds of varying kinds. EPDM geomembranes are made from rubber and can be welded together with tape and primer. EPDM can be reinforced or unreinforced. RPE geomembranes have a high tensile strength and puncture resistance because they are reinforced. RPE geomembranes also can be welded with heat. PP geomembranes can be unreinforced or reinforced depending on the application. Reinforced PP geomembranes also have a high tensile strength and puncture resistance because they are reinforced. PVC geomembranes are also unreinforced and have been used successfully for decades in water canals, ponds, and reservoirs. PVC geomembranes can be welded with heat and/or solvents. Please click below to access FGI’s Pond Leakage Calculator. The Fabricated Geomembrane Institute (FGI) is pleased to welcome its newest consultant member– New Zealand’s leading environmental and engineering consultancy, Tonkin +Taylor. Head-quartered in Auckland (NZ), Tonkin + Taylor operates throughout the South Pacific, Australasia and Southern Asian region. The company is 100% employee owned and operated and is highly experienced and skilled at delivering significant solid waste, transport,utilities, coastal management, flood protection and climate change adaptation capital works programs. Their FGI liaison is senior civil/environmental engineer Jonathan Shamrock, JShamrock@tonkintaylor.co.nz. Please help us welcome Tonkin + Taylor to the FGI!!!! 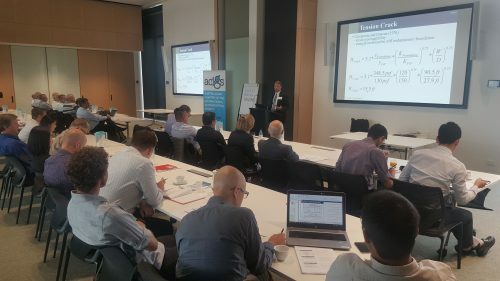 The Australasian Chapter of the International Geosynthetics Society (ACIGS) recently hosted their International Speakers Series in Australia and New Zealand. The New Zealand seminar was held in Auckland on Monday, February 18, 2019 and presented by Timothy Stark, Professor of Geotechnical Engineering in the Department of Civil and Environmental Engineering at the University of Illinois at Urbana–Champaign. Important lessons were learned by the 40 delegates attending the seminar about current best practice use of geosynthetics for embankment and lined waste containment facilities based on current research and from analysis of real life case studies of failures. 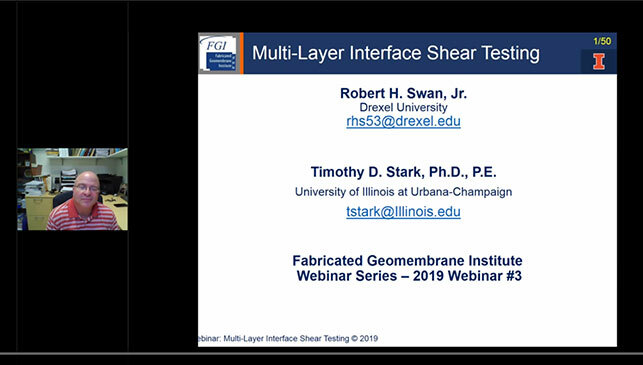 Geosynthetic Interface Testing and Selection for Static and Seismic Stability where he explained the importance of interface shear testing for geosynthetic lined slopes, the correct test methods to use, and the interpretation of these test results. Vertical Geosynthetic Drain Analyses for Embankment Failure on Soft Soil were he presented case histories illustrating design parameters for prefabricated vertical (wick) drains and their practical implications for stability of embankments. Seismic Stability of a Geosynthetic Lined Slope where he presented, using a case study, the importance of designing for peak and residual shear strength on landfill liner systems base and side slopes respectively and the appropriate factors of safety to use for the design cases. Elevated Temperatures in Waste Containment Facilities and Effect on Geosynthetic Service Life and Facility Design where he presented on the causes and implications for geosynthetic service life of elevated temperatures in waste containment facilities. A quarterly newsletter that will keep you informed about all things Geosynthetics. Use our Excel calculator to learn what measurements are needed to properly plan for your pond liner project. Frequently asked questions from members, customers and industry professionals answered. A comprehensive guide to industry and our member material offerings for fabricated geomembranes.